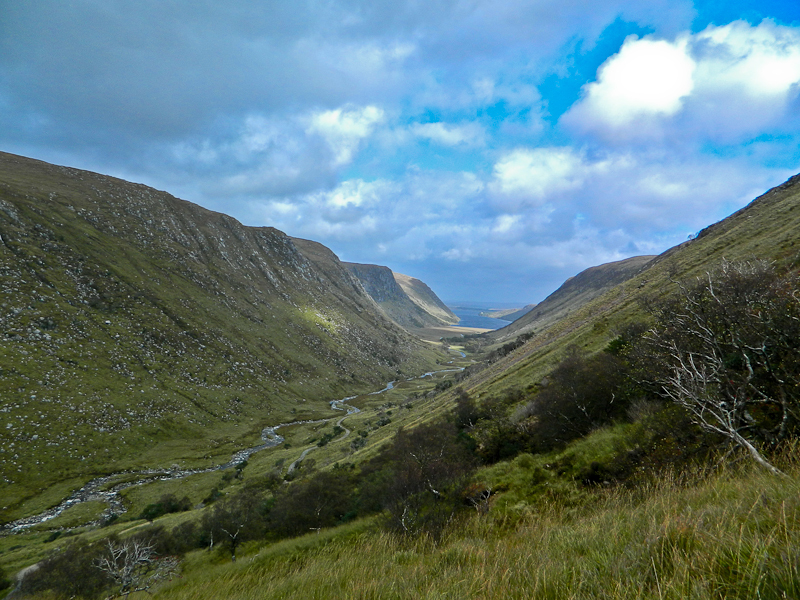 The long boggy ridge leading to Farscallop, marks one of the edges of Glenveagh National park. The estate of Glenveagh was created in 1857-9 by the purchase of several smaller holdings by John George Adair. In 1860, Adair went hunting on land he had rented to tenants in violation of their rental agreements. When the tenants objected, an irate Adair threatened them. A year later, in April 1861, he removed forty-seven families from forty-six houses in Derryveagh. After marrying his American born wife Cornelia, Adair began the construction of Glenveagh Castle in 1867, which was completed by 1873. Adair also had a large ranch in Colorado and died suddenly at St. Louis, Missouri in 1885 while on his way back to Ireland from there. After her husband’s death Cornelia took over the running of the estate and introduced deer stalking in the 1890’s. Over the next 30 years she was to become a much noted society hostess and continued to summer at the castle until 1916. Following the death of Mrs Adair in London in 1921, Glenveagh fell into decline and was occupied by both the Anti-treaty and Free State Army forces during the Irish civil war. Glenveagh’s next owner was not to be until 1929 when purchased by Professor Arthur Kingsley Porter of Harvard University. The Kingsley Porters mainly entertained Irish literary and artistic figures including close friend AE Russell whose paintings still hang in the library of the castle. Their stay was to be short however. On July 8, 1933, Porter disappeared without a trace while spending the night in his fishing hut on Inishbofin. The subsequent inquest into his disappearance and assumed death was the first to be held in Ireland without a body. However, people continued to report sightings of the professor in locations around the world for many years after his disappearance. The last private owner was Mr Henry McIlhenny of Philadelphia who bought the estate in 1937. Henry McIlhenny was an Irish American whose grandfather, John, had originally come from Carrigart, north of Glenveagh, emigrated to the USA and amassed a fortune, largely through his invention of the gas meter. (Another member of the McIlhenny clan came up with an equally notable invention: Tabasco sauce!). After buying the estate Mr McIlhenny devoted much time to restoring the castle and developing its gardens. In 1975 he agreed the sale of the estate to the Office of Public Works allowing for the creation of a National Park. In 1983 he bestowed the castle to the nation along with its gardens and much of the contents.